Will be streamed online. Doesn't sound like they are going to say, "we didn't see anything!" Oh, definitely not a prank! This year's physics Nobel, I would venture. If anyone can SEE an event horizon, that would be major news in physics. More likely it's the radiation from the accretion disk. Has that not been seen plenty of times already? Would they make such a fuss about it now? Trust me, it IS major news in physics. I wasn't joking about the Nobel Prize. They will see the silhouette of the BH on the event horizon. Accretion disks are no big deal - we see them in IR when the SMBH has a little feed, now and again. Last edited by jonesdave116; 2nd April 2019 at 12:09 PM. Maybe the BBC had privileged access? I'm guessing a group of tightly co-orbiting quarks stars. So it is the radiation from the accretion disk that they're seeing and not the event horizon, they've just managed to image the innermost part of the accretion disk which allows them to get a measure of the shape of the event horizon but they're not imaging the event horizon itself. No, it is the silhouette of the BH on the event horizon. As per the infographic I posted in post #8. To those claiming this isn't an image of the event horizon: If I show you a photograph of a person's shadow, I'm pretty sure you'll agree that it's a photo of a shadow and won't pedantically say "No, that's a photo of the light around the shadow", even though without that light there'd be no shadow to see. No it isn't, it's a silhouette of the event horizon on the innermost part of the accretion disk. Your distinction between the BH and the event horizon makes no sense anyway, since the operational definition of the BH is the event horizon. Last edited by caveman1917; 6th April 2019 at 07:40 AM. Except that in this case the distinction is important, and even if we let the language be inexact as per your example then the description of "the silhouette of the BH on the event horizon" is still plain wrong. Generically, a black hole casts a silhouette on the wallpaper of emissions by nearby accreting gas. This “shadow” arises because the black hole swallows light rays coming toward the observer from just behind it. Meanwhile the bright region around the “shadow” is supplemented by other light waves from behind the black hole that just miss the horizon. Strong gravitational lensing bends light rays so that even material directly behind the black hole will contribute to the light around the dark region. The resulting silhouette is what is meant by a “portrait of a black hole,” a fitting picture in which the black hole truly is black. The author is the same person who is giving the lecture in the video I linked, which might be worth a look for those that seem a bit confused about what is being imaged. As I said, it is the silhouette of the event horizon on the innermost part of the accretion disk, not the silhouette of the BH on the event horizon (which is nonsensical since the BH is the event horizon, as per the common definition of a BH). Last edited by caveman1917; 6th April 2019 at 07:59 AM. I click fullscreen and it says fullscreen is not available. Click here to learn more, which dumps you into a generic full screen explanation. Which conveniently leaves out that they want you to watch on YouTube so they can run ads. 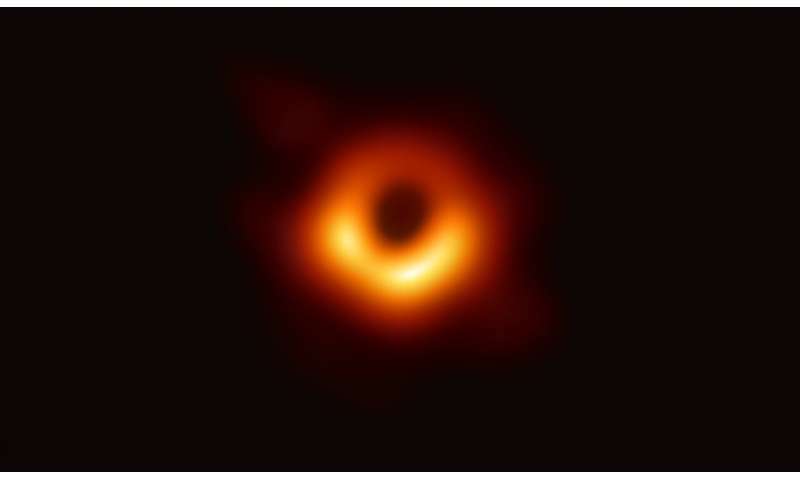 The silhouette cast by the horizon of the supermassive black hole in M87 can now be resolved with the emerging millimeter very long baseline interferometry (VLBI) capability. Last edited by jonesdave116; 6th April 2019 at 03:04 PM. Veritasium: How to understand the image of a black hole. This is what the image may look like. Last edited by Steve001; 9th April 2019 at 08:07 AM. Thanks for that, really helped me understand what we could expect to see. Strongly recommend it to folk like me that can't visualise what happens to light around a black hole. I've waited 15 billion years, I think I can wait a bit longer. Yes, let's not confuse "black hole" with "singularity". The black hole kinda includes the event horizon. Last edited by jonesdave116; 10th April 2019 at 06:38 AM. Except that there ain't no **** getting out of M87*! Nonsense. Just aim to the center. I saw that in plenty of movies, and cinema has never failed to give me valuable life lessons. Somebody explain what we're seeing there like I was a bright ten year old, please. I think I gleaned that we may be looking at the inner edge of an accretion disc around a black hole's event horizon, oriented almost face on and glowing in mm wavelength radio frequencies. So how does "silhouette" come into it, because to me that implies the event horizon is blocking light coming from behind?